Meet Rowan, an incredibly silly 10 year old boy that was just recently diagnosed with autism at 9 years old. I have spent a little time with Rowan over the past couple years and he never fails to make me smile. 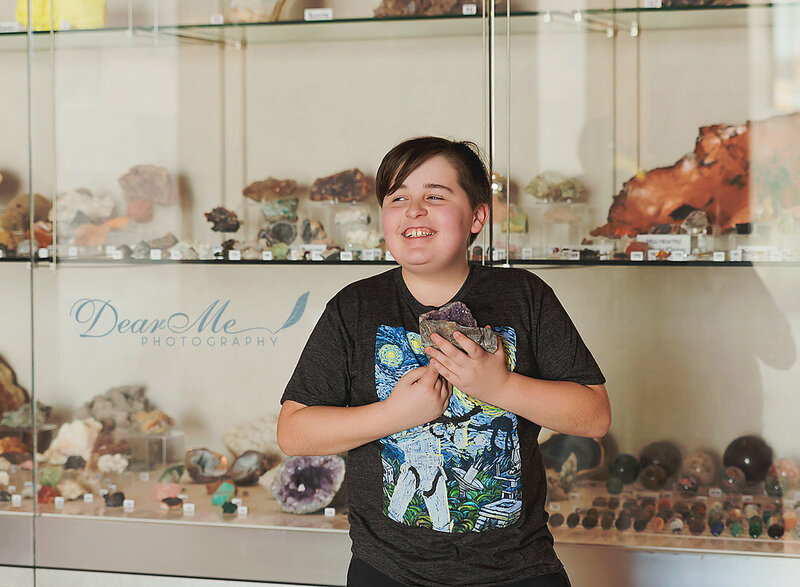 He brought his amethyst with him for our session and was happy to tell me so much about it and other rocks and minerals. With Rowan, he was diagnosed with apraxia of speech and dyspraxia when he was 2.5 years old. Apraxia of speech is a motor speech disorder that makes it difficult for children to speak. ( Apraxia Kids is a great resource if you would like to learn more.) A lot of Rowan’s issues could be explained with the apraxia in a way. He would get overwhelmed and his parent’s would attribute that to him not being able to be understood. He didn't always make great eye contact, which his parent’s assumed stemmed from embarrassment for the speech problems. Rowan was pretty much nonverbal until he was 5 1/2 years old which is definitely part of apraxia. However, Rowan’s parents always kind of knew there are other things that were not necessarily just apraxia. Even if he couldn't necessarily repeat words, he would randomly mimic sounds. When the family would be out in public and he would hear someone laugh a certain way or say something in different intonations, he would immediately repeat it whether it would be the laugh or humming the tone that someone just used. He has, and will occasionally, repeat a word or phrase over and over. We later learned this was echolalia. He will excessively touch and smell inanimate objects. He has very specific interests and throws himself into those things. At a very young age Rowan excelled in math. His sister is two years older than him and would always try to trip him up with something she was learning in math and he always knew the answer. Rowan has an incredible memory for dates and retains random facts that do not seem true, but when someone verifies them, he is correct 99% of the time. He is very meticulous about time, even if he is doing something he enjoys. Hippotherapy is a great example of that, he loves riding the horse but needed to know minute by minute what time it is so he knew when it was time to be done. He even sleeps with a clock in his bed. Both he and his sister have a great sense of humor, however hers is very dry and sarcastic. Sarcasm and figurative language is hard for him because he doesn't typically understand that she is joking and takes it very personally. Rowan has a hard time with large groups of people, especially when the attention is on him. He can go to a street fair where there are a lot of people and can be okay a lot of the time as long as his mom is there to give him one on one if needed, but birthday parties almost always bring with them at least one melt down. He struggles a lot in school with getting overwhelmed by other kids and having big reactions to what others would see as small problems. These big reactions are what really prompted the testing. Rowan’s parents received pressure from the school to have him tested for ADHD and to look at medication. They were reluctant for quite a while to do that, but finally gave in and Rowan was given not only the ADHD diagnosis but an autism diagnosis as well. So many things suddenly made sense and while they didn't want to do medication, it does help. They don't know that it is the perfect solution yet, but it definitely has made a difference. He is still the same amazing child, just with a little extra alphabet soup. Rowan is a self proclaimed Math Magician (He misunderstood his principal in kindergarten when he called Rowan a Mathematician, so Math Magician has just stuck). He has an incredible wealth of knowledge when it comes to animals, dinosaurs, and rocks/minerals. He is such a lover and has a deep heart for everyone. Rowan is so empathetic, that if he hears a sad story or of someone being mistreated it breaks his heart and brings him to tears. He loves to go fishing with his dad but refuses to keep the fish because each life is important. He has a great sense of humor and is always cracking jokes. Rowan struggles with reading people and knowing how to appropriately respond. He works very hard to use his tools, but in the moment it is nearly impossible to remember what those tools are. He badly wants to be friends with everyone, but has a difficult time doing activities with his friends because he is very rigid and has a hard time with compromise. Some of Rowan’s special interests include math, rocks/minerals, animals, dinosaurs, and video games. He can throw himself into any of those topics or activities for hours. He also wants to play football. It has been recent focus of his so his parents are trying to find ways to make that attainable. Rowan does not do well any sort of criticism even if it is constructive and he has a hard time with coordination due to his dyspraxia (dyspraxia is a condition affecting physical co-ordination that causes a child to perform less well than expected in daily activities for their age, and appear to move clumsily), but if he wants to do it, his parent’s will help him do that.